Gain extra protection this winter with a fine meshed spark liner. For all open fires, our fireguards can be fitted with a spark liner to help contain any stray sparks. Once fitted with a fine mesh spark liner, the fireguard will offer peace of mind when you may have to leave the fire unattended. We offer a made to measure service as well as optional wall fixings to secure the fireguard in position. 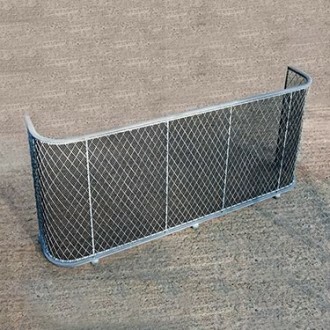 The fireguard shown is an X Large 48in wide version in the Aged zinc galvanized finish with black painted liner.